Sharp’s 55-inch full high-definition PN-V550A professional LCD monitor features a 3.5 mm* ultra-slim bezel that gives you the flexibility to build video walls with the dimensions to grace virtually any commercial or public space. 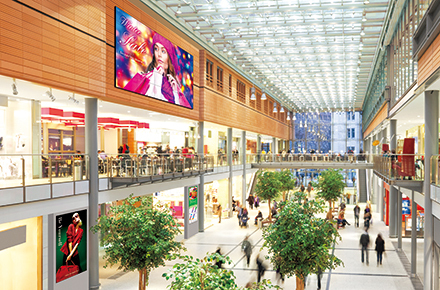 Whether installed in a shopping mall, hotel, control room, transport hub, or conference hall, a bank of these monitors will convey your message with overwhelming style and precision. Four monitors set up in a 2 x 2 configuration, for example, will let you display every last pixel of native 4K Ultra HD (3,840 x 2,160-pixel) content on the equivalent of a 110-inch screen. 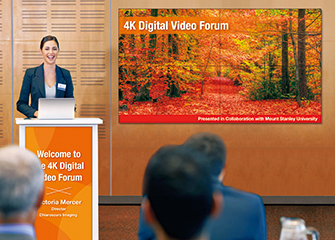 Thanks to Sharp UCCT (Uniform Colour Calibration Technology), colour reproduction and brightness are beautifully consistent on each individual LCD monitor and thus across the entire video wall. * 3.5 mm is the minimum combined frame width for neighbouring monitors, excluding the gap between the monitors. PN-V550A monitors can be joined together to create an eye-catching video wall that expands the reach of your message. Multi-monitor configurations are easy to assemble and easy to control via the RS-232C interface or via a network. The ultra-slim bezel on a PN-V550A enables you to combine multiple units to create a virtually seamless digital canvas. The bezels of adjacent monitors in a video wall combine for a total bezel width of just 3.5 mm*1—1.2 mm on the right and bottom sides, and 2.3 mm on the left and top sides*2. This enables the display of large, crisp images with minimal distraction and maximal impact. *1 Minimum combined frame width for neighbouring monitors, excluding the gap between them. *2 Non-display area for neighbouring monitors is 3.9 mm. The PN-V550A combines full-HD (1,920 x 1,080-pixel) resolution with a display brightness of 500 cd/m2, to deliver stunningly bright and detailed images. Full-HD resolution ensures that everything from fine text to intricate graphics is displayed crisply and clearly. Four PN-V550A monitors set up in a 2 x 2 configuration, for example, can beautifully render every single pixel of 4K Ultra HD (3,840 x 2,160-pixel) content in a form equivalent to a 110-inch LCD monitor. What’s more, Sharp UCCT (Uniform Colour Calibration Technology) realises brilliant uniformity of colour and brightness. 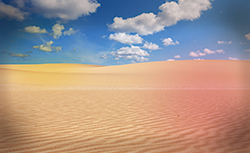 To varying degrees, unevenness of colour and brightness may occur in LCDs. To compensate for this, Sharp UCCT ensures uniformity of colour and brightness across the entire LCD monitor by properly adjusting colour levels with high precision and high definition (at the pixel level). 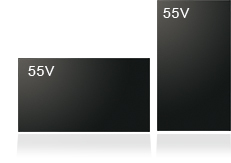 The display characteristics of each small area in the LCD are measured in terms of various RGB input signals. 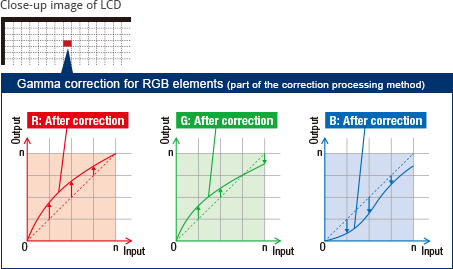 Uniformity of colour and brightness is then calibrated and corrected for each RGB signal element in a given area, as shown in the graphs below. * Brightness level may decrease when activating UCCT. With Mirror Display mode*, the same image can be displayed on a daisy chain of PN-V550A monitors for the powerful impact of visual repetition. To ensure safe handling of the PN-V550A, all four of its corners are fitted with robust carrying handles. Together with the monitor’s light weight of 25 kg, these handles enable safe transport and easy, time-saving installation—whether vertically or horizontally. The PN-V550A conforms to the RoHS Directive restricting the use of hazardous substances. 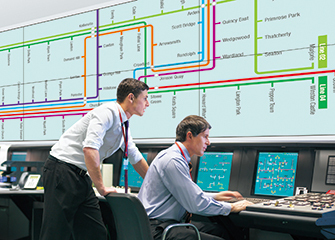 The PN-V550A offers a choice of landscape or portrait installation, allowing customers to select the mode that best suits their display content and application. VESA-compliant mounts provide right/left pivot and swivel, ensuring a high level of safety when the PN-V550A is mounted on a wall or suspended from a ceiling. Built solid, the PN-V550A is ideal for use in 24-hour stores and in other demanding professional applications that require round-the-clock operation seven days a week. Thanks to its RS-232C interface, the PN-V550A can be easily controlled and monitored from a central location via a PC. Each monitor can be assigned an individual ID code to specify when remotely turning that monitor on or off, changing its input, or making various screen adjustments and settings. The PN-V550A can be easily operated through a Web browser and monitor control software*.